In a recent study published in the Financial Analysts Journal, Ang, Madhavan, and Sobczyk (2017) highlighted that using regression-based factor loadings to measure managers’ factor exposures, even when conducted on a rolling basis, can be misleading due to excessively smoothed coefficients, given that active managers adjust their exposures dynamically. The authors argued that holdings-based attribution offers more insight, and they used the actual holdings of mutual funds to analyze the contribution to active returns by factors. With that in mind, in a previous post, we performed a holdings-based performance attribution to highlight that the improvement in relative performance of actively managed large-cap mutual funds stemmed entirely from the stock-selection effect (excess returns of 1.75%), demonstrating their abilities to pick winning stocks. In this follow-up post, we use the same holdings of the managers to take a closer look at their active factor exposures relative to the S&P 500 and their contribution to active return. This risk-based attribution analysis complements our prior Brinson performance attribution analysis, providing a holistic picture on the sources of excess returns. During the 12-month trailing period ending June 30, 2017, large-cap active managers, on average, were underweight to value, dividend yield, and size factors, and they had higher positive tilt to beta, momentum, and leverage factors (see Exhibit 1). In addition, we observed lower negative tilt to price volatility and earnings variability factors within the same group of managers. 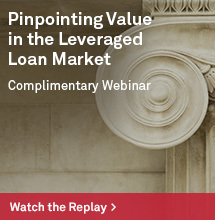 Earnings variability and leverage are measures often used as proxies for the quality factor. Taken together, large-cap managers were, therefore, more exposed to lower quality and higher volatility during the 12-month period studied. 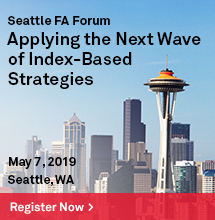 This generalized behavior comes as no surprise, as the equity market during the same period has been ripe for risk taking, with lower quality outperforming higher quality in the large-cap space. 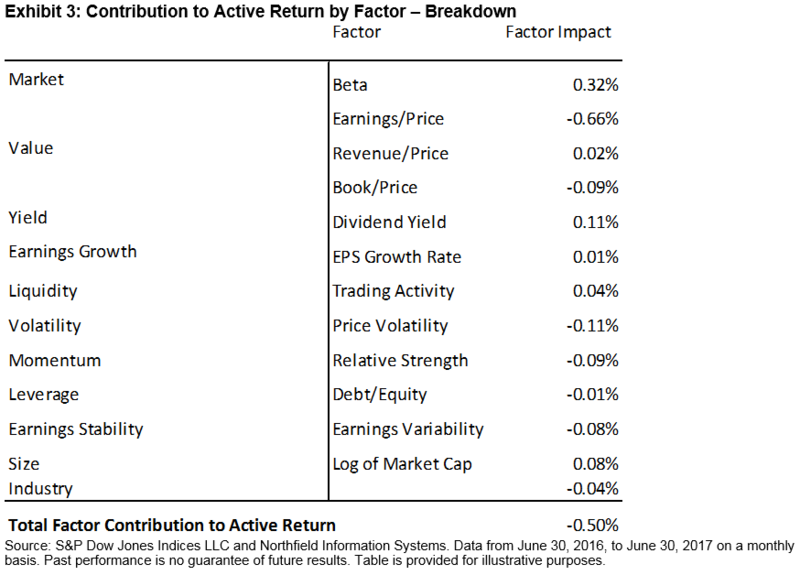 In terms of the impact of managers’ factor bets on their average active return, we can approximate that not all exposures have been handsomely compensated. For example, dividend yield, revenue/price, and size had negative monthly average returns to the factor, which has resulted in an overall positive factor impact (see Exhibit 3). 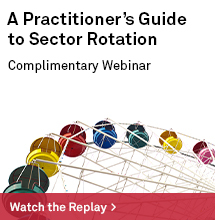 Beta has also been a rewarding factor for those managers seeking broad market exposure. 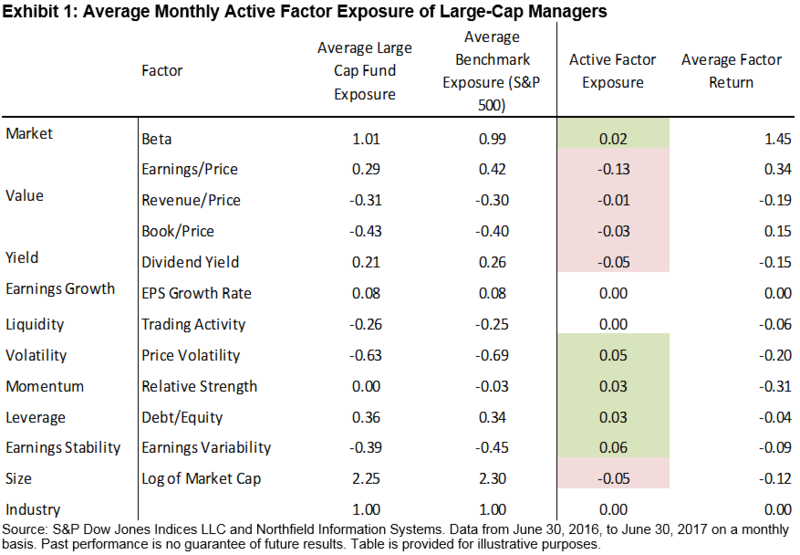 It has been the best-performing factor, and large-cap managers on average have been overweighting their beta exposure. However, the average monthly return to other value factors such as book/price and earnings/price have been positive and the underweight to those factors have detracted from the average portfolio active return. 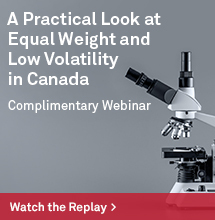 Higher average exposure to volatility, momentum, and to earnings variability factors have also detracted from excess returns. Taken all together, we now have a fuller picture and insight on what has worked for actively managed large-cap mutual funds and what hasn’t over the 12-month period studied. Judging by the longer-term historical SPIVA® results, large-cap U.S equity remains a challenging asset class for an average active manager to beat and to do so consistently. It remains to be seen if the results we witnessed can be repeated in the future. Ang, Andrew, A. Madhavan, and A. Sobczyk, “Estimating Time-Varying Factor Exposures,” Financial Analysts Journal. Volume 73 Number 4. We use the Northfield US Fundamental Risk Model to estimate the managers’ factor exposures. Based on the total returns of the S&P 500 Quality Index (14.79%) versus the S&P 500 Quality – Lowest Quintile Index (17.44%) from June 30, 2016, to June 30, 2017. Factor impact is reported as the geometrically compounded return of monthly average active exposure * monthly factor return. Beta here refers to the CAPM beta, where the market is represented by the general Northfield universe comprising approximately 5,000 U.S. companies.